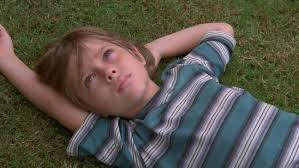 I saw Richard Linklater’s film ‘Boyhood’ last night. Go and see it if you can – it’s a wonderful, moving film about children growing up. In case you don’t know, the director made the film over 12 years with the same actors. It follows an angelic looking boy aged 5 and his sister and separated mum and dad through all sorts of stages and phases and problems and joys (and toys and music and films) as he grows into a boy on a bike, a spotty adolescent, a young man, and then leaves home. The moment he finally packs up his stuff and it hits his mother that he’s off, that both children are gone, and that her raising of children is done is so brilliantly acted and so moving. I won’t say more, but whether you relate to the children or the parents it will make you think about time and change and families and love. And as the mother of a 15 year old boy and 13 year old girl, I afterwards saw their lives, too, pass before me like a film. And how quickly, so quickly, it is going. And how I need to make the most of it. This entry was posted in Childhood, Parenting by Ingrid. Bookmark the permalink.